As in today's scenario, many a people are writing stories on the real aspects of today's world , which covers their professional and personal life as well.. and one such story has been written by sudarshan nagarajan . This story revolves around 3 people who are caught in the whirlpool of a hectic job and an arrogant and merciless superior.. This story is a roller coaster ride of 3 people ajay , meghna and suraj..The story starts with the protagonist ajay who decided to quit the job in his IT company and decides to settle for something else.. another character in this story is meghna who is actually a fun filled girl, who decides to quit her job, as she did not find it interesting..suraj gets fired from his company owing to recession.. This book will amaze you with the twists and turns and will make you realise how life can sometimes be unpredictable ..how life will unfold for all three of them and how they will meet and cross each other's path ? Will their decisions he fruitful ? Or will they end up making their life come to a disastrous end..? 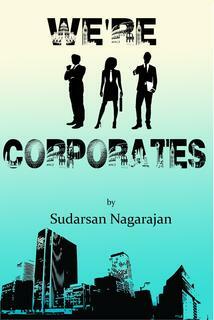 My verdict : we' re corporates by sudarshan nagarajana is a catalyst novel , which will definitely encourage people to work hard for their dreams .the character's characterisation will set an example in front of you and will make you realise the importance of one's dream and the decisions you take in your life.. The author has wondefully scripted the characters , the story is simple yet catchy and will keep you hooked till the end ..the best of all is the motivational part and how it enlighten ones mind , this will definitely grab your attention..the blurb of this book actually makes the novel predictable..the language is simple yet catchy..though the story is some parts is quite predictable.. Negatives : this book lacks proofreading ..you can find editing issues in every second page..sentences are quite incomplete and punctuation and grammatical errors can be found.. Overall i would just like the suggest something to the author : when you portray a character, you just need to complete the characterisation, sideline characters part is something which creates confusion in reader's mind.. Overall it was nice .. It could have been a bit better , had it been edited properly..